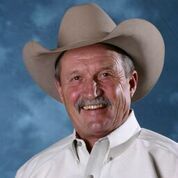 Legendary rodeo announcer Bob Tallman, better known as “the voice of professional rodeo” is the nine-time recipient of the distinguished PRCA Announcer of the Year award. He has announced every major rodeo in North America and has dedicated his life to educating his audiences about our Western Heritage and the Spirit of the West. Tallman’s tenure encompasses numerous accolades. He is a member of several halls of fame including the National Cowboy Hall of Fame and the Texas Cowboy Hall of Fame. In addition, he serves as a board of director for the Texas 4-H. He is accomplished to say the least but his core values span way beyond his awards. He is a businessman, television commentator, spokesman, rancher and philanthropist. His Foundation based in Houston is near and dear to his heart. He is dedicated to raising money for the University of Texas MD Anderson Cancer Center Children’s Cancer Hospital. When he’s not announcing rodeos he lives his passion which is raising angus cattle on his ranch in North Texas.